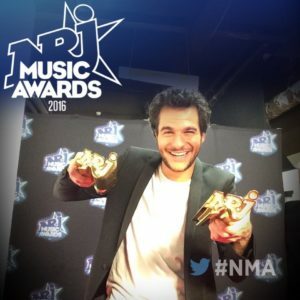 Amir has just won two awards at the NRJ Music Awards. A special tribute to the victims of the terrorist attack one year ago in Paris took place at the award show, and the 2016 Eurovision participant told us not to forget. After his award at MTV EMA the other day, Amir continues to be awarded for his fresh career. Saturday night was the 16th ceremony of NMA at Palais des Festivals in Cannes, France. This ceremony aims to award many artists for their songs and career. Since the creation of this ceremony, other Eurovision participants have been awarded. NMA is a ceremony to award mostly Francophones artists, but also international singers who have partnerships with radio station NRJ. This ceremony has been organised every year since 2000 in Cannes, France. At this ceremony, there are different categories. The public can vote through internet for each category. Only one category is chosen by SMS and calls: French Song Of The Year. The NMA is also a way to celebrate music and peace. This year, the French artist Louane and Charlie Puth sang the song Imagine by John Lennon. This was a tribute paid to remember the victims of the attack in Paris last year, on the 13th of November 2015, and victims of terrorism world wide. Saturday night, Amir won, first of all, the category of Francophone Revelation of the year. He was emotional and thanked everyone for this award. He held a speech about the victims of the attack in Paris during the 13th of November 2015. He reminded people to think about them. Later during the ceremony, he performed his Eurovision entry J’ai Cherché for which he achieved his second award: French Song of the year. After winning this he thanked the ones who believed in him as the French Eurovision participant. Amir was the first French Eurovision participant to be awarded. Other Eurovision participants however have won the prestigious award. Celine Dion, who won in 1988, had won 2 awards, in 2002 and 2008. She was nominated this year in the category: Francophone Female singer of the year but didn’t win this year. The British group Blue who participated at the Eurovision Song Contest in 2011 have won 2 awards also. One in 2004 in partnership with Elton John, and also in 2005. His album Au Coeur De Moi is currently a golden record in France with 42,300 albums sold at the moment. The very same album made the charts in 3 countries: France (#6), Belgium (#136 Flanders region, #16 in Wallonia ) and Switzerland (#36). Before Eurovision, he came 3rd in The Voice France, which kickstarted his career. He is currently on a nationwide tour with 38 dates around the French territory. In the video below you can watch the a performance of the Eurovision entry which brought him these awards.